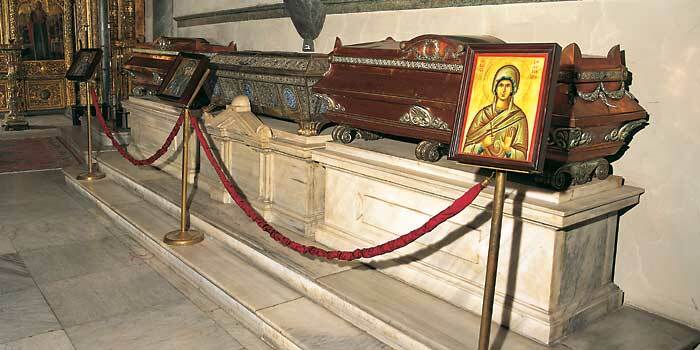 When visiting the Patriarchal Cathedral of Saint George in Constantinople (Istanbul), there are three prominent incorrupt relics of female saints displayed for veneration, the first of which is Saint Solomone, followed by Saint Euphemia the Great Martyr and then Saint Theophano the Empress, as one moves towards the sanctuary. Saint Solomone is traditionally attributed to being Solomone, the mother of the Maccabees, whose feast day is August 1; this is the day she is celebrated at the Ecumenical Patriarchate. However, historians have suggested that the relics do not belong to this Solomone, since she is recorded to have been burned to death with the Seven Maccabees. 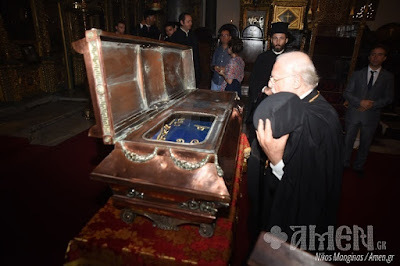 The relic probably belongs to Saint Solomone the Myrrhbearer, mentioned in the Gospels as a follower of Christ, who is celebrated in the Orthodox Church on August 3rd. 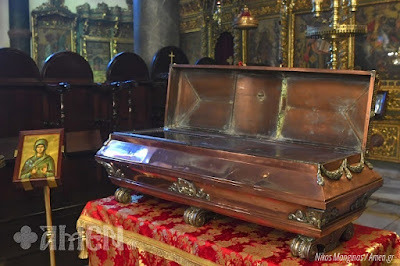 Other relics attributed to Solomone, the mother of the Maccabees, which in fact probably belong to Solomone the Myrrhbearer, can be found at the Athonite Monastery of Xeropotamou.